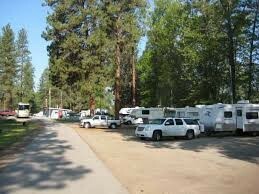 Nestled along the Similkameen River the Princeton Municipal RV Park and Campsite hosts a total of 73 sites including 43 riverside sites. Our full service sites have 30 amp power and fresh water hookup. Our guests have access to a centralized washroom and shower facility. Picnic tables, fire pits, a child’s play area and a horseshoe pit round out the amenities. WIFi is available throughout the park. A sani-dump is available. Our caretakers, Jim and Karen, have a wealth of knowledge on local attractions and provide entertaining stories of Princeton. Stop in at the Princeton Visitor Centre; located in downtown Princeton with RV parking in the back; to find out the places to see and things to do in our wonderful small town.